Buy a 0800 number and have it pointed to your existing landline or mobile phone. Calling 0800 Numbers from mobile phones is free ( as of 1st July 2015 ). Due to this change by Ofcom, customers who receive calls from a mobile phone on their 0800 number will pay an additional mobile originating surcharge of 5p per minute, at all times. 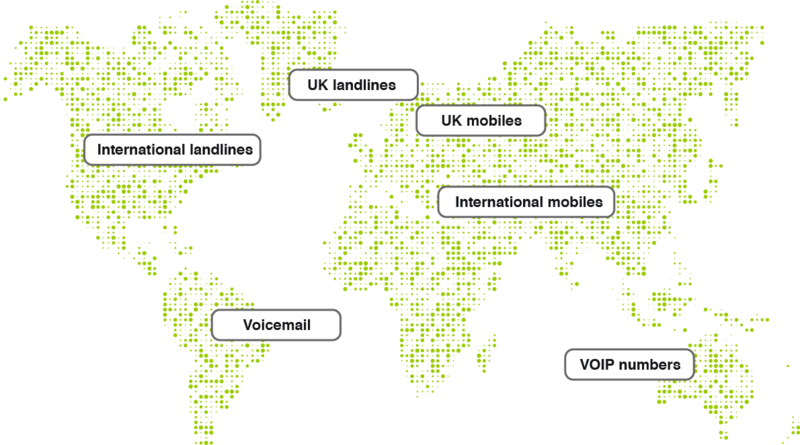 We can route 0800 numbers to UK landlines, UK mobiles, VOIP numbers, Voicemail boxes, International landlines and International Mobiles. If you are looking to route to an international location it can be done, but please call us so that we can explain the costs to you in full. The technology is more versatile than it used to be, with telecommunications features becoming more advanced. Advanced features like Interactive Voice Response (IVR) systems allow your customers to select from a range of options, so that the call can be routed more efficiently. You can also use functions such as Voicemail and Call Whisper. Every phone number we provide will be delivered using the best carrier networks in the UK, including BT (wireless and cabled) and Opal. As part of your 0800 number package, we will send you a fully itemised bill every month which shows the amount of calls received, phone numbers for everybody who has called and graphs identifying the busiest times and breakdown of cost. We itemise every single call so that our fees are transparent and you understand exactly what you are getting for your money. We are so confident in our pay as you go service that we do not feel the need to lock customers into long term contracts, unlike other similar companies. This gives your business more flexibility and, as a result, most customers stay with us for a very long time! 0800 numbers are not as expensive as they used to be and costs are still in decline. Our promise to you is that we will monitor costs and ensure that you are always on the best possible price tariff. Most companies just want to point to a landline, which is easy. Our additional features will allow you to do almost anything you want. To see what options you have please visit our additional features page. Most of our customers use memorable numbers as a sales line to encourage callers. An independent study by Warwick University has identified that 80% of people are more likely to call a number beginning with 0800 to enquire about purchasing a product or service. Based at home in your study? Having a memorable number may make you look significantly larger than you actually are. 0800 numbers disguise the geographic location of your business. If you ever move you can take your number with you – anywhere in the world! You will have the capability to change where the number is pointed to using our online portal. Use multiple numbers in different adverts to that you can track the amount of calls you are receiving. We can even play a greeting when you pick up the call that says "this is a call from the Yellow Pages" if you require. In the unlikely event of an issue at your office you can take some comfort that your calls can be routed to another location immediately. QHow Long Will My Phone Number Take to Go Live? AProviding your payment has cleared it will only take minutes to get it in service. QCan These Numbers Be Called From Abroad? AMost countries will route the call to your number, but it is not guaranteed as it does depend on the country. If you want to advertise an 0800 phone number abroad, contact us for further information. QWhy Are Some Numbers More Expensive? AMost companies want a number which is memorable and stands out from the crowd. Supplies are limited and these numbers (Gold Numbers) are running out fast, which unfortunately leads to an increase in price. QCan I Still Use The Landline That the Number Is Pointed to? AYes. The number we provide you will just sit on top of your existing service. People will still be able to call your landline or mobile and your new number will not interfere with any existing service that you have. QHow Much Am I Charged From Payphones? QWhen I Call Out Will People See the 0800 Number As My Phone Number? AThis won't automatically be the case, but you can speak to your existing phone line provider about adding a service called CLIP (Calling Line Identity Presentation). QWhat Payment Methods Do You Accept? AWe can take most credit cards (including American Express), PayPal, Direct Debit, BACS and Cheque. Most of our customers pay us by Direct Debit for ease of managing their account. QCan I Change Where the Number Is Pointing to Myself? AYes. We have an online portal that will allow you to manage where your number is routing to. The online portal cost a little extra, but it is packed with additional benefits. Phone numbers are allocated out to companies like us by telecommunications governing body Ofcom and we sell them on to our customers. They are becoming increasingly popular and supplies are running low in the UK, but we still provide a great range of freephone numbers, including the new number range, 0808 numbers. If you have any questions regarding our phone number services please feel free to contact us. We can be called on 0207 760 7600, you can SKYPE US, or use our online live chat.